The Missouri Botanical Gardens – Shaw's Garden, as it's informally known – represents and exceeds the vision and mission started by Henry Shaw, a center for science and conservation, education and horticultural display. As all gardens, the Missouri Botanical Gardens evolved since Henry Shaw opened the gardens to the public in 1859, yet it has remained true to the purpose and style envisioned by Shaw 155 years ago. Considered to be one of the top three botanical gardens in the world, the Missouri Botanical Gardens flourishes on 79 acres within the city of St. Louis. It has received the National Historic Landmark designation and is one of the world's leading centers for botanical exploration, plant science, and conservation. The Missouri Botanical Gardens has much to offer. Henry Shaw intended the garden to be a botanical garden dedicated to beauty, science and education, given to the public upon his death, rather than an estate garden. Shaw was born in Sheffield, England in 1800, living most of his adult life during the Victorian era. He arrived at the shores of the Mississippi River at St. Louis in 1819 and proceeded to make his fortune. In 1819, St. Louis was still a small town, only 50 years old. “ It ran about three blocks deep for about a mile along the bank of the river.” Shaw began selling cutlery, hardware and engaged in real estate investments. Within two decades, he had amassed his fortune and retired. Never having married, Shaw traveled throughout Europe, the Mediterranean and Turkey (part of the Ottoman Empire). It was during his travels he decided to start a botanical garden. A botanical gardens of this magnitude could never be adequately covered in a brief GardenNotes post. Indeed, my husband and I spend 12 hours roaming the grounds on three separate visits, yet I left feeling I received only a brief introduction to the many aesthetic and intellectual delights it offers. As with a visit to any garden, any single visit exposes one to a brief moment in the life of the garden. I could lament that we were months late for witch hazels and camellias, 2 months late for tulips and daffodils, several weeks late for the iris displays, flowering cherries, azaleas and rhododendrons, and only days late to see the giant titan arum, Amorphophallus titanum (photo at left), but we were spot on to view their enormous daylily display (numbering well over 2000 specimens), summer flowering bulbs, roses, water lilies and the sacred lotus (photo at right), vegetable and flower demonstration beds in full bloom at the Kemper Center for Home Gardening, and the entire acreage a full verdant foliar extravaganza. Indeed, it was the soothing and ever present green that was such a delight to me, accustomed to seeing our foliage-challenged landscape. The Missouri Botanical Gardens might seem like a contradiction to some, mixing, blending and interweaving of Victorian England with gardens of the Near and Far East. By the mid nineteenth century, plants from around the globe had had a full century of robust trial and experimenting to foster a revolution in garden trends. The east influenced the west, and vice versa. Along with ambassadors, trade goods and people, we exchanged plants. Influences of exotic culture crept into the gardens as well as into society. One underlying theme that remained in both the eastern and western gardens was the desire for exhibiting the control of nature. Indeed, it was fashionable to design one's estate gardens with foreign influence and nuances. It was a heady and exciting time for gardens and the Empire. And Henry Shaw, an Englishman by birth, too, reveled in the horticultural bonanza. What better place in the United States than to celebrate the world's flora diversity than at the gateway city of St. Louis. English and Victorian. The Victorian District includes Tower Grove House, Shaw's country residence, a proper Victorian garden, maze, observatory, herb garden and pincushion garden. I also include the Boxwood Garden and English Woodland Garden, considering them gardens of the English influence. The Victorian District is a royal delight in overall effect and complexity. Bedding out annuals was one of the Victorian designs that is elevated to a level not experienced even by Queen Victoria's gardens, dare I say? The Boxwood Garden was at the tops of our favorites, as I'm sure the English Woodland Garden would be in the springtime. International Gardens. International gardens include the Ottoman Garden, Chinese Garden, the Japanese Garden, The Bavarian Garden, The German Garden and Conifer and Rock Garden. The Ottoman Garden is the only known public Ottoman garden in the world. The scholarly Chinese Garden honors St. Louis's sister city of Nanjing. Gracefully abiding on 14 acres, the Japanese Garden reflects a “garden of pure, clear harmony and peace” typifying a “wet strolling garden” and hosts the annual Japanese Festival Labor Day weekend. And to the international gardens, I also add the gardens of the three glasshouses: Linnean House, Temperate House (containing exhibits and displays of plants from five Mediterranean climates around the world, including the centerpiece Moorish Garden, modeled after the Alhambra in Granada, Spain) and the Climatron, the largest geodesic dome glasshouse, as they all contain global plant collections. I'm not allowing much description space here, but the glass houses are not to be treated lightly. Each has different purposes whether for historical interest, for biodiversity and preservation and education: illustrating climate similarities and the plants around the globe. Did I mention Africa? No, I don't think I did. MoBOT puts on a special exhibition for roughly four weeks during the summer, this year it was Plants of Southern Africa and Madagascar. My familiarity of these plants was surprising to me – many of them are sold in the succulent section of home improvement centers, in smaller containers, of course. MoBOT has a history in African botany, recognized “as the United States center for the study of African botany” since the 1970's, and in Madagascar since the mid 1980's, two regions that have biodiversity hot-spots. Plant collections. Specific plant collections are done up in gardens dedicated to their display in all their glory. Specific plants are highlighted and supported by an outstanding cast of background characters. Notable collections include the Iris Garden, the Daylily Garden, The Azalea-Rhododendron Walk, Magnolia Grove, The Boxwood Collection, the Hosta Garden, Dwarf Conifer and Rock Garden, a sensory garden, two different rose gardens, two bulb gardens and again the Herb Garden. Other notable plant collections appear in more than one garden and include witch hazel, camellias, orchids, peonies both tree and herbaceous, viburnums, flowering dogwoods, water lilies and lotus. The collection of boxwoods is not limited to the Boxwood Garden, but numerous varieties of boxwood are liberally used throughout the gardens. The two bulb gardens contain bulbs from early spring into fall, including all the springtime favorites, as well as a nationally recognized daffodil collection with over 750 different varieties. Also in the bulb gardens are true lilies, tropical amaryllis, dahlias, cannas, aroids, glads, and herds of flapping elephant ears. Did I mention trees? MoBOT could be an highly respected arboretum just with the trees. Nearly five thousand trees on site of what was once the prairie! Included among the trees are the Ginkgo biloba, the living fossil that has the unique distinction of being the sole species of the division Ginkgophyta, in the class Ginkgoopsida, order Ginkgoales, family Ginkgoaceae and genus Gingko. Included among the groves of trees are towering plantings of the Dawn Redwood, Metasequoia glyptostroboides, (photo of tree at the left and down a bit, seed planted the same year my husband was born) thought to be extinct until a few were discovered in China; seeds were sent to the Missouri Botanical Gardens in 1948 resulting in some very tall specimens. Themed Gardens. Lastly, the category of themed gardens. These are no offhanded afterthought. Any botanical garden would boast of them as the centerpiece of their garden, while at the Missouri Botanical Gardens, the are an integral part of the exceptional whole. The Kemper Center for Home Gardening, the Carver Garden and the Children's Garden overflow with ideas and wonders, all beautiful and educational. The Kemper Center for Home Gardening is a garden within a garden, within a garden. Twenty three demonstration gardens of every sort enables gardeners from Missouri and surrounding areas to glean ideas for their homes on an 8.5 acre corner of the greater garden. Beauty, functionality, design, suitability and sustainability are themes explored to a high level. Programs such as the Plants of Merit, Plant Doctor, reference library and adult educational classes are standard at the Kemper. Tropicos. Missouri Botanical Garden's Garden Herbarium, among the six largest, earlier this year announced their collection has reached the 6.5 million specimen total with the addition of a new genus. Described by Garden curator Dr. Carman Ulloa, Quipuanthus, in the scientific journal, “Systematic Botany”, they are plants from the foothills of the Andes in Ecuador and Peru. Because of the astounding number of plants unforeseen by Linnaeus in 1753, a system of cataloging data needed to be invented to enable the free flow of information on plant names and classification. Data for the Garden's and Herbarium collections is available to all via Tropicos, a data base developed by Garden botanist Dr. Robert Magill. Also included is information on 1.2 million published plant names, which represents more than 361,000 type specimens, over 4 million specimen records and nearly 250,000 plant images. Scientists around the world, as well as regular people like you and me, can access Tropicos.org for plant information. The Missouri Botanical Gardens has recorded and cataloged every plant ever planted in the gardens, including their accession record and digitally pinpoints on the digital grounds map each location it's been used. This information is also available online to the public. Botanicas. What started out as a small collection of horticultural books belonging to Henry Shaw, the library has exploded into the Botanicus project, “a freely accessible, Web-based encyclopedia of digitized historic botanical literature” from the Missouri Botanical Garden Library. Dedicated to providing access to botanical literature, Botanicus includes more than 2.3 million imaged pages from over 5600 volumes in 1196 titles. Subsequently, Botanicus is “reused by the Biodiversity Heritage Library (BHL) consortium” as their model for the purpose of allowing the study of organisms to flourish. Botanicus is also available to scientists and non-scientists alike. For instance, if you wanted to read Carolus Linnaeus's Species Plantarum, published in 1753, you could view it here. Two additional components of the Missouri Botanical Gardens are the Shaw Nature Reserve and the Sophia M. Sachs Butterfly House. These two places, unfortunately, didn't make it on to the itinerary on this visit. The Shaw Nature Reserve, formerly known as the Shaw Arboretum, is located 35 miles west of St. Louis in Gray Summit, Missouri. The four concepts of beauty, research, conservation and education are practiced here as well on 2400 acres of Ozark-border landscape, with one a a half miles of Meramec River frontage. The reserve includes 14 miles of hiking trails through Missouri's diverse biological ecosystems, including the Ozark-border, floodplain forest, upland woods, dolomite glades, tallgrass prairie, oak-hickory woodlands and savannas, and wetlands. The Pinetum – a 55 acre managed park-like expanse, and 5 acre Whitmire Wildflower Garden native plant demonstration garden is also part of the Shaw Nature Preserve and accessible to the public. The Sachs Butterfly House opened in 1998 and became a part of MoBOT in 2001, exhibiting over 60 butterfly species and more than 100 tropical plants inside the 8000 sq. ft. glass conservatory, and was the first butterfly house to be accredited by the Association of Zoos and Aquariums (AZA). 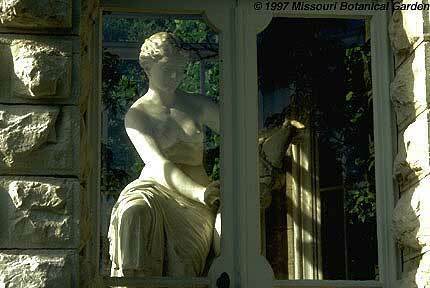 The Butterfly House is located at the Faust Park on the west side of St. Louis. Each of these individual gardens and glass houses deserves a separate post just to do them some justice, their composition and plant selection so excels the norm. If one's travel funds were on the short side and could only take a moderate vacation, but yet wanted to get the flavor of the world's flora, one could do no less then spend a week mingling with the plants of our planet at the entirety of the Missouri Botanical Garden. Their website, www.mobot.org, contains a wealth of information; Tropicos and Botanicus will keep one reading and learning for a lifetime.